Andrea Bocelli's voice has been pleasing the listeners all over the world for a decade already and it is high time to celebrate the anniversary. He thought the best way to do it was to organize a big concert somewhere in New York and release a collection of selected material. His fans have been all content with the decision although one record is definitely not enough to collect all the best creations performed by this tenor acknowledged all over the world. Nevertheless producers and Bocelli himself have chosen the songs from each of the artist's successful albums including four times platinum Romanza, twice platinum Sogno and the recent work Amore which has also reached a platinum status. Thus collection called Vivere: The Best Of is a selection of bright and amazingly beautiful songs performed by Andrea Bocelli during various periods of his creative path making conclusions and explaining the success of this outstanding performer. The record offers both opera and pop compositions and has a couple of brand new songs to the fans' great pleasure. The collection's new songs have all been produced by legendary David Foster (Josh Groban), and each of them worthy of being performed by a singer of Bocelli's level. The album opens with one of them, splendid La Voce Del Silenzio (The Voice of the Silence) with a beautiful melody and as the lyrics aimed to attract our attention to the things we usually ignore. Track Sogno is quite an early song from the eponymous album, and with Il Mare Calmo Della Sera Andrea's way to glory began at Sanremo Festival in 1994. Laura Pausini has refined title track Dare To Live (Vivere) with her powerful vocals, and another new creation A Te would be incomplete without Kenny G's famous saxophone. Classic song Besame Mucho from Amore could not help being included in the collection as it is the brightest example of a pop standard performed by Bocelli. Brilliant ballads Time To Say Goodbye with Sara and The Prayer with Celine Dion are the songs that made Bocelli so well known on the world pop stage, and new work Io Ci Saro featuring talented pianist Lang Lang has become a great entry and makes a perfect part of the collection. One of the earliest songs Romanza has definitely become a real refinement of the collection as well as the emotionally powerful song Vivo Per Lei with Giorgia, which is a confession of the singers of their love for music. Amazingly beautiful creation Bellissime Stelle pretends to become a new hit, and the album closes with one of Andrea's favorite songs Because We Believe from the last record Amore that has become a hymn of the Olympics in Turin. Although Vivere: The Best Of is far from the singer's full best works list it is sure to refine any musical collection and give a lot of pleasant minutes. Italy has been always considered one of the countries where talents are born, and Andrea Bocelli is obviously one of them. Known around the world he has learned the best from the best Italian opera singers. This autumn he has seen off to the last journey one of them – Luciano Pavarotti which was his real hero singing Mozart's Ave Verum Corpus at the funeral service as a sign of an imperishable memory and respect to the great tenor. Celebrating the ten years of his career Bocelli is full of gratitude to everybody who supported him during these years, and Vivere: The Best Of is actually a present to the fans and all those who are not indifferent to classical and beautiful pop music. The collection can be useful also to those who is just discovering Andrea Bocelli as it contains really the best creations that provide a full picture of the artist's creative work. 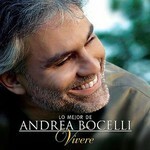 Taking into account the singer's unique talent we can be prepared for another or more than one decade of the incredible music ahead, and Vivere: The Best Of is only the first in the multitude of Andrea Bocelli's best compilations.